To urgently and publicly request of Mr. Marko Pavic, currently serving as the mayor of the town of Prijedor and the Prijedor local authority to acknowledge the war crimes and crimes against Humanity committed in Prijedor, to honor the fallen victims as well as their survivors, and to allow access to the site of the former concentration camp in Omarska. On May 31, 1992, in Prijedor, a small town located in the north western part of Bosnia and Herzegovina, local authorities led by monstrous Bosnian Serb leaders, have issued the decree regarding non Serb population that at that time lived in this town. The decree ordered all non-Serb citizens to wear clearly visible white armbands when appearing in public, thereby isolating them and submitting them to the worst humiliation and later extortion that Europe and its history remembers since the Second World War. The decree also called for their houses to be marked with either white sheets or flags, making them a clear target to those who, at that time, were in a position of power. This decree marked the introduction of the cruelest and bloodiest ordeal that resulted in mass murders, rapes, assaults, and ethnic cleansing. It led to the creation of concentration camps in which innocent human beings were humiliated, starved, beaten, tortured, and later executed in mass numbers. The result of this regime was the ultimate removal of more than 94% of Bosniaks and Bosnian Croats from the territory of the town of Prijedor and its municipality within only 3 months. This appears to be a fate similar to the one to which the Nazis subjected the Jewish population in Poland, by issuing a similar decree in 1939 whereby all Jews were ordered to wear white armbands with the blue Star of David symbol, clearly marking them for discrimination, deportation and execution, based on their ethnic and or religious affiliation alone. 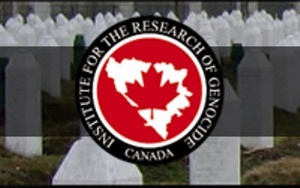 The International Expert Team of the institute for Research of Genocide Canada would like to take this opportunity to once again remind the World that genocide and crimes against humanity were constant in the municipality of Prijedor during the period of 1992 to1995. As a result of this horrific policy, 102 children and 256 women were brutally tortured and murdered, a total of 3,173 civilians perished, 31,000 people were detained in death camps, and 53,000 people were victims of persecution and deportation. In just three months 94% of the Bosniak population from Prijedor was cleansed and eliminated. In the geographical region of the town of Prijedor, Bosnian Serbs, with the help of its army and numerous paramilitary forces from neighboring Serbia and Montenegro, conducted massive, deliberate and organized killings and rapes, as well as the expulsion of primarily Bosniaks and the Croats population. The genocide in Prijedor was investigated at the International Criminal Tribunal for former Yugoslavia (ICTY) during Slobodan Milosevic’s trial and in the interim indictments against Radovan Karadzic and Ratko Mladic. Thus far the ICTY has convicted 28 people for the crimes against Humanity in Prijedor. The genocide in Prijedor has also been prosecuted by the Court of Bosnia and Herzegovina and in the District Court in Banja Luka. Bosnia and Herzegovina is today a country that functions on the basis of a peace agreement signed in 1995, which as an additional insult to the bleeding injury, left town of Prijedor in the hands of Bosnian Serbs. Although having numerous opportunities, municipal authorities of this town to this date have not acknowledged any sufferings or crimes committed against Bosnian Croats or Muslims. By their refusal and/or silence on this important subject they have denied that these crimes were ever committed. The mayor of Prijedor, Marko Pavic, and the local government refuse to publicly acknowledge any of the crimes committed in Prijedor, despite numerous judgments and evidence presented by international and local courts. Memorials that were scheduled to honor the victims of the crimes committed in this area have been forbidden and access to the sites of their suffering denied by the likes of ArcelorMIttal, a company that now owns the site of the former concentration camp in Omarska. It is imperative that the victims and their families are acknowledged and the appropriate attention is given to those that were tortured and expelled from their city solely based on their ethnic or religious background. We invite you to show your solidarity with the victims of mass atrocities committed in the town of Prijedor by calling upon the current mayor Mr. Marko Pavic to publicly condemn the committed crimes, and offer the survivors, and all in favor of peace, tolerance and co-existence, access to the site of concentration camp Omarska so that the appropriate respects and memorial service can be given to those who were persecuted and killed only because they were not born or belonged to the desired ethnic or religious background of that time. We sincerely thank you for supporting this public call and are confident that you will not ignore this vital opportunity to stand on the side of justice, peace and equality for all. Chris Mathieu, "Bosnia twenty years later, I love Bosnia"